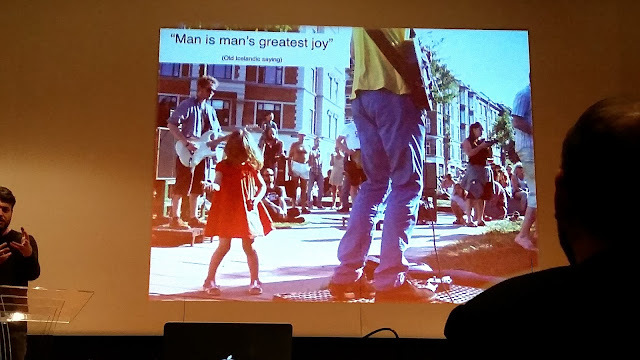 This slide "got" me, led me to a 1980 book and to a mesmerizing video about human nature. It just so happens that my two favorite presentations in the last decate were about "placemaking" the first by Fred Kent from Project for Public Spaces the second by Mathew Lister from Gehl Architects (above). 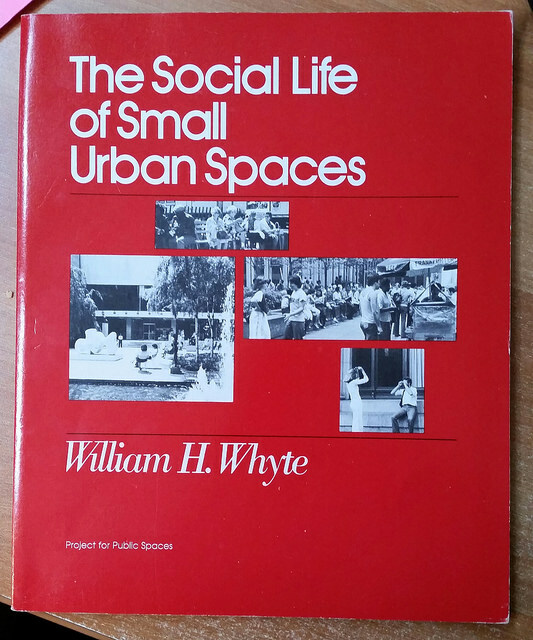 Turns out both were inspired by this book: The Social Life of Small Urban Spaces - William H. Whyte. Remember William Whyte? If you are my age you probably read his "The Organization Man." "What attracts people most, it would appear, is other people. If I belabor the point, it is because many urban spaces are ... designed as if the opposite were true..." William H. Whyte. Fortunately there's a video produced for Public Broadcasting. I just don't know what's wrong me. I am the worst advocate ever. And here we have this terrific source book for urban advocates which I claim to be. And doesn't everyone want happier cities that make people happier? 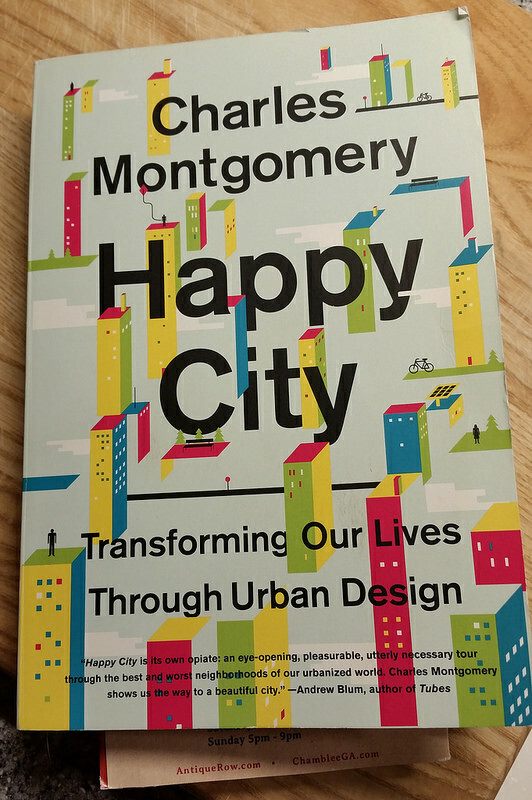 Happy City: Transforming Our Lives Through Urban Design by Charles Montgomery. Thanks to Atlanta City Studio for lending it to me. I recommend reading it in little chunks. This is where I'd go if I needed a couple slides for a presentation. It covers the waterfront, quotes from Aristotle to Freud to Jacobs, vignettes, anecdotes, psychological research, with 316 footnotes to back it up. But I just can't get through it. Your results may vary. See, I have these trigger warnings. First: The subtitle is "Transforming Our Lives Through Urban Design" and he really means it. But I lump subtitles like this in the self-help section and I'm am beyond self-helping - ask my family. Honestly if there was a book that proposed "transforming our lives with meatloaf and key lime pie," I'd probably stop eating them so much. Second: The proposition is that my suburban brother Kenny has no soul. As Montgomery puts it (frequently), "Does the detached suburban home REALLY make its owners more independent and free?" (emphasis added). We know the answer to that one, it's urban activist speak for "Kenny has no soul." It irritates him to have no soul, makes him extra cranky to know that he is ruining it for everybody. Worse, Kenny no longer listens to perfectly good urbanist advice. Third: Why can't we all be Vancouver? I wish Atlanta could be Vancouver except in Atlanta. Vancouverism as almost a real word. Atlantism isn't. I'd settle for a Medieval piazza with a Renaissance upgrade, a Piazzas del Campo instead of Centennial Olympic Park. Don't we all deserve it? Sure would make urbanism easy. Fourth: I only need one of these sorts of books and for me that was Suburban Nation: The Rise of Sprawl and the Decline of the American Dream by Andres Duany, Elizabeth Plater-Zyberk, and Jeff Speck to explain why Kenny has no soul and that makes me sad. The next Terry's Tiny Book Review will be Makeshift Metropolis: Ideas about Cities by Witold Rybczynski which I got through just fine. Anyone know how to pronounce his name?